Guwahati previously spelled Gauhati is a major city in eastern India, often considered as the gateway to the North-East Region (NER) of the country and is the largest city within the region. Dispur, the capital of the Indian state of Assam is situated within the city. Guwahati was formerly known as Pragjyotishpura meaning meaning "city of eastern light," "city of eastern astrology" and Durjoya meaning "impregnable" in ancient Assam. These were the capitals of the ancient state of Kamarupa under Varman's and Pala's respectively. Excavations trace the origins of the city to around the 6th century and it was the capital of Assam until the 10th century. Many ancient Hindu temples are in the city, Kamakhya, Umananda, Navagraha, Sukreswar, Basistha, Lankeshwar, Doul Govinda, Dirgheshwari, Ugro Tara, Rudreswar etc., are but a few. With Kamakhya being most known as part of 51 Pith, thousand of devotees offers their prayer to this temple every day. Lokpriya Gopinath Bordoloi International Airport (IATA: GAU, ICAO: VEGT) is also known as (Guwāhāti International Airport) and was formerly known as (Borjhar Airport). Guwahati airport is a major hub for flights to North-East India and limited international destinations. The hill resort cities of Shillong and Tura are connected by regular scheduled helicopter services run by Pawan Hans. Shillong (30 min), Tura (50 min), Naharlagun (Itanagar), Tawang (75 min). Guwahati is connected by train with major cities like Kolkata, New Delhi, Bangalore, Thiruvananthapuram, Chennai, Hyderabad, Chandigarh and Mumbai. It is connected to all major cities of North East India by bus. There are overnight bus services for Kohima, Imphal, Itanagar, Siliguri. Uma Nanda Temple, A 17th century temple on a river island of the same name is dedicated to Shiva. It was built by Ahom king Gadapani on this picturesque Brahmaputra isle, also called Peacock island. You can hop into a shared ferry/motorboat for Rs10 and return on the same or another boat free of charge, or reserve the entire boat for yourself. All shuttle boats leave from the KachariGhat between the Deputy Commisioner's office and the lower courts. The island is also a sanctuary for an endangered population of Golden Langurs which you can see from very close quarters. They have thrived successfully on this uninhabited island chosen for their translocation from their last refuge in the Manas National Park. The island also has a Ganesh temple and is small enough to be explored on foot. Ugro Tara Temple, Lotaxil. A temple dedicated to the deity Tara. The goddess in the sanctum sanctorum is not an idol but a pit of water. Assam State Museum, southern end of Dighalipukhuri tank. The museum is closed on Mondays. Navagraha Temple, Chitrasal Hill. An 18th century temple dedicated to nine Celestial bodies is atop the second highest hill in Guwahati. Kamakhya Temple atop the Neelachal hill, the highest spot in the city draws pilgrims from all over India especially during the Ambubachi festival. A high seat of the shakti sect,it is associated with the legend of the mother goddess who slayed the legendary demon king Narakasur who ruled ancient Assam. Pandu a river port on the south bank of Brahmaputra in West Guwahati was the entrepot to Guwaahati before construction of the Saraighat bridge in the early 1960s. Basistha Ashram a place of pilgrimage and a picnic spot near the Sandhychal hills south of Dispur, the seat of the State government lies at the confluence of the three streams Sandhya, Lalita and Kanta, names of the wives of legendary sage Vasistha who had set up this Ashram. It is near the Balaji temple which is near the ISBT-inter state bus terminus. Assam State Zoo And Botanical Gardens on RGB Road also known as Zoo Road. Hotel Realto is located in the heart of Guwahati on GNB Road in Panbazar, 5 minutes walking distance from the Guwahati Railway Station, 40 minutes drive from the Guwahati Airport and 45 minutes away from the ISBT. Hotel Rialto have a total of 34 rooms in Standard, Deluxe and Executive categories with state of the art security system in place. Each room has facilities like Air¬conditioning; Bath/ Shower, Color TV with satellite channels; Doctor on Call, Direct Dial Telephone, Laundry service and Capsule Lift service is available. 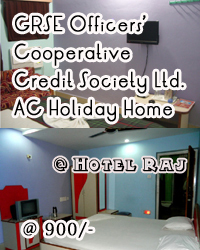 Hotel is fully secured with modern surveillance system. Pick & Drop facility from the Airport / Railway station. Full Day Guwahati CityTour Full day Shillong Tour. Travel Packages for entire North-eastern Region. Round the clock room service is available, Buffet Breakfast and Dinner is served in the Hotel's multicuisine restaurant ABHINANDAN. Hotel Realto have fully equipped Air-conditioned conference centre with facilities capable of accommodating up to 40 people. Conference / meeting room for 22-25 persons in U shape, Theatre style seating for 40 in persons. All the conference hall amenities are available on hire. • Extra Bed Charge: 600/- Per Night. • 22.416% Tax will be paid on room tariff at spot.